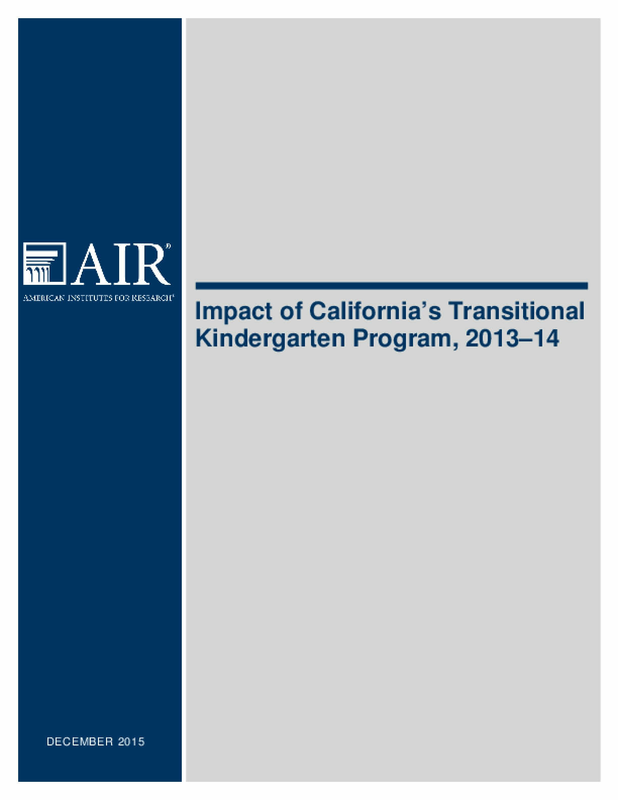 Transitional kindergarten (TK)—the first year of a two-year kindergarten program for California children who turn 5 between September 2 and December 2—is intended to better prepare young five-year-olds for kindergarten and ensure a strong start to their educational career. To determine whether this goal is being achieved, American Institutes for Research (AIR) is conducting an evaluation of the impact of TK in California. The goal of this study is to measure the success of the program by determining the impact of TK on students' readiness for kindergarten in several areas. Using a rigorous regression discontinuity (RD) research design,1 we compared language, literacy, mathematics, executive function, and social-emotional skills at kindergarten entry for students who attended TK and for students who did not attend TK. Overall, we found that TK had a positive impact on students' kindergarten readiness in several domains, controlling for students' age differences. These effects are over and above the experiences children in the comparison group had the year before kindergarten, which for more than 80 percent was some type of preschool program.